One of Ripley’s most prominent historic homes has been put on the open market for the first time in over 600 years by Sir Thomas Ingilby. Chantry House enjoys a prime south-facing position fronting the cobbled village square, next door to the Boar’s Head. 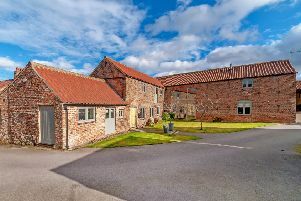 Built on the site of the original chantry, which would have housed the village priests who at one time provided education for the village and surrounding community, the current building dates from the 1830s when Ripley was rebuilt as a model estate village and the house was let to wealthy tenants. Further building work took place during the Victorian era to coincide with Harrogate’s rising popularity as a spa town destination and the arrival of rail travel. It was during its Victorian heyday that the house gained its own ballroom, adding a touch of glamour to this Grade II listed Yorkshire gritstone cottage. “The tenants at that time clearly enjoyed some fabulous parties and it was around then that the large glass conservatory was added,” said Sir Thomas. In the late 20th century the ballroom became an art gallery and was open to the public. Chantry Art Gallery is still in the village but is now just around the corner. Ripley itself is a unique village that is regularly listed as one of the most desirable places to live in Yorkshire. “There are not many villages of 200 people that have a shop per 20 residents,” said Sir Thomas. “We have a great community here and there’s always something happening. “At the Hotel de Ville – Ripley’s splendidly eccentric Gothic town hall was modelled on a French town hall – you can watch films, play snooker or badminton, enjoy concerts and plays and even do Zumba. Sir Thomas sees this as an opportunity for a family to move into Ripley and become part of the close-knit group of privileged residents that enjoys a free pass to the castle grounds and gardens whenever they are open. Chantry House is on the market with Harrogate estate agent FSS for £995,000.